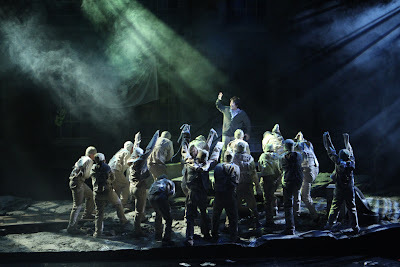 Article first published as Theater Review (Seattle): Jesus Christ Superstar by Andrew Lloyd Webber and Tim Rice at the Village Theatre on Blogcritics. By now, almost anyone interested in theater has an opinion about Jesus Christ Superstar, Andrew Lloyd Webber and Tim Rice’s rock opera about the final days of Jesus. My take: despite a thoroughly uneven score, Webber’s future penchant for empty bombast hadn’t quite taken over yet, and ultimately, the show is rather moving. The reframing of the story to place Jesus and Judas as opposite sides of the same coin is intriguing, but it’s a little hard to accept Webber and Rice’s Jesus — a petty, whiny, violent figure who hardly seems like the leader of a movement. With that out of the way, let’s look at Village Theatre’s production, on stage through July 31. Directed by Tony and Pulitzer Prize-winner (and longtime Village associate artistic director) Brian Yorkey, this is a staging that brims with excitement and features unwaveringly high production values. The set pieces are impressive, the orchestra is on point and the show has the added kick of having two actors alternate in the roles of Jesus and Judas — Michael K. Lee and Aaron C. Finley. Lee played Jesus at Thursday’s opening night performance, and his incredible vocal range electrified the stage, particularly in Act II’s “Gethsemane,” where Jesus laments his upcoming fate. Finley, while possessing strong vocals, was done no favors by the abundance of reverb his mic was afforded and his own troubles with enunciating clearly. He tended to look a little lost in the role, particularly in the big showstopper, “Superstar,” where he seemed swallowed up by sequins and the surrounding dancers. One wonders if his meek demeanor might be more suited to the role of Jesus. Like a lot of productions of Jesus Christ Superstar, this one revels in its anachronisms, with set design by Matthew Smucker that evokes the feel of a war-torn refugee camp with its concrete barriers and a 20-foot tall barbed-wire fence. Melanie Burgess’s costume design establishes the apostles as a cross between street urchins and gang members — except for Jesus and Judas, who look they stepped out of a hipster meme, with Jesus’s keffiyeh scarf and Judas’s thick-rimmed glasses, beanie and messenger bag. High priests Caiphas (Eric Polani Jensen) and Annas (Timothy Glynn) are clothed in oversized white almost-zoot suits, while Pontius Pilate (Greg Stone) gets outfitted in high-powered CEO-ware. The costumes themselves are top-notch, but the merging of so many disparate influences is kind of silly — it’s just random diversity without a coherent conceptual basis. Filling in supporting roles are Jennifer Paz as the star-struck Mary Magdalene and Michael Nicholas as Peter, who denies Christ after his arrest. Both possess lovely voices, but don’t convince as to why they’re so passionate about Jesus. Making an impression in short periods are James Scheider as Simon and Brandon Whitehead as King Herod. Scheider is an ensemble player through much of the show, but breaks out with killer dance moves in “Simon Zealotes,” while Whitehead is a one-scene wonder in “King Herod’s Song.” As the only outright comical number in what is otherwise a mostly somber show, this song has the ability to stop the whole musical dead in its tracks. Not so with Whitehead, whose lecherous, leering Herod is a riot. In a production the size of Jesus Christ Superstar, it’s hard to pull everything off without a hitch, but Yorkey brings a tremendous amount of energy to the proceedings. It’s certainly enough to overcome shortcomings both technical and inherent to the text. Jesus Christ Superstar is on stage at Village’s Issaquah location through July 3, and moves to the Everett location from July 8 through July 31. Tickets are available at Village Theatre’s website.